Lytham St Annes Carpet Cleaning also provide a professional mattress cleaning service in the Lytham St Annes area. We are a local, reliable cleaning company and we are proud to deliver customer satisfaction every time with our mattress cleaning service. Regular mattress cleaning helps to protect your mattress and extends its life. Lytham St Annes Carpet Cleaning will carry out a thorough cleaning process to kill any bacteria that live in your mattress and eliminate dust mites. People who suffer with most common skin conditions and allergies such as eczema, asthma, itchy skin will benefit the most from this steam cleaning service. We are equipped with the latest professional machinery on the market. 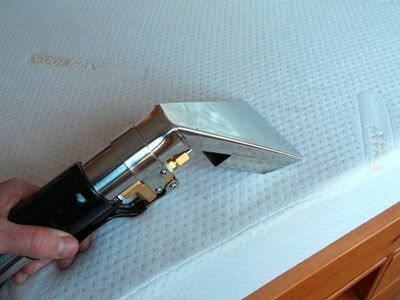 We use powerful hot water extraction system, which simultaneously cleans and dries the material of your mattress. The powerful injection of spray with detergent kills the bacteria rooted in the mattress, eliminates dust mites and cleans the dirt. The suction system extracts the dirt, fungus and deodorizes the fabrics. It leaves you with a healthy and clean mattress. We will carefully examine any stains and spots, after which the appropriate detergent is carefully applied to dissolve the spot or stain. We treat stains such as ink, red wine, blood, grease, shoe polish etc. We are fully trained and qualified mattress steam cleaner technicians, who also will be able to give advice and recommend the appropriate treatment for different types of spillages and stains. We will leave a “Don’t Panic!” advice sheet for you in the event of spillages on your carpets or soft furnishings. If you book this service with carpet cleaning, we will offer a discount. We offer competitive prices and flexible working hours. 100% Customer Satisfaction is guaranteed when using Lytham St Annes mattress steam cleaning service. Our cleaners are trained to provide extra care to your belongings. They will clean underneath your furniture where possible. We also offer Guard-X protection treatment.